Hi, my name's Eric and I'm a Singaporean living in Bangkok. 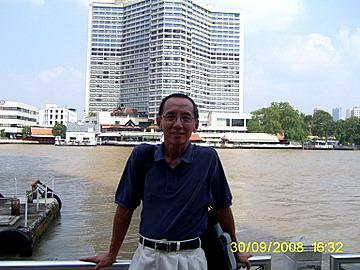 About Bangkok legacies is the story of why and how did I build this website, Tour Bangkok Legacies? As a boy I loved reading and was fascinated by writers like Joseph Conrad and Somerset Maugham who stayed at the Raffles Hotel in Singapore and the Oriental Hotel in Bangkok. Today, Ernest Hemingway and Frederick Forsyth remain my favorite writers. When my father asked me what I'd like to do when I grew up, I immediately answered, a writer. Father's cryptic reply was, "What are you going to eat?" Dear father, a practical and down-to-earth businessman, was absolutely right. What was I going eat indeed? Today as I'm retired, I think I can afford to relive my boyhood dream. Why Bangkok's history? I've been visiting Bangkok since 1985. I've had a strange attachment to the city even though it was so drastically different from Singapore where I grew up. Perhaps this is my version of "A Tale of Two Cities". There were also a series of seemingly unrelated events that only linked together decades later. They all had one thing in common, Bangkok. My Bangkok story starts in the 1960s. In 1967 an American, Jim Thompson disappeared while on holiday in the Cameron Highlands in Malaysia. He was never found. I discovered later that he was the famous Thai silk king. How could someone just vanish without a trace? The mystery remains unsolved to this day. That incident lingered on in my memory. Another incident that stuck was while I was reading a Thai Airways in-flight magazine on the way to Bangkok years later. It was about the M R Kukrit Pramoj Heritage Home in Bangkok. I must see that place, I said to myself. The 1960s movie "The Ugly American" came to mind. Marlon Brando was the US ambassador to an imaginary Asian country seething with insurgency and on the brink of revolution. The man who played that country's premier was M R Kukrit Pramoj. He became the 13th Prime Minister of Thailand in 1975, two years after the October 1973 revolution. 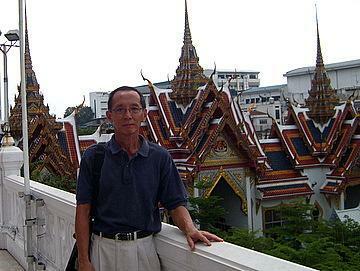 In my earlier years, I followed the military coups in Bangkok avidly. Over dinner I once remarked to a friend that the shortest road to parliament is on the turret of a tank. That of course was youthful fantasy. The harsh reality is it's the shortest route to jail, at least in Singapore! The revolution on 14 October 1973 fired my idealism. Imagine the students of Thammasat University sparking off a chain of events that toppled a military dictatorship. They paid a heavy price, then and later. The massacre at Thammasat on 6 October 1976 filled me with sadness. Isn't it the army's mission to defend the people, not shoot them? What would I have done in a similar situation? It was a haunting thought. Since then, I've always had a deep respect for that generation of brave young men and women who stood up and died for a cause. One day in the 1990s, a Thai friend drove me around the old city. As we passed the Democracy Monument, she said, "So many people have died here." That remark shook me. As the trauma of Black September 1992 was still fresh, I probed no further. I had to find out for myself. "So many people have died here." Why don't we learn from history? 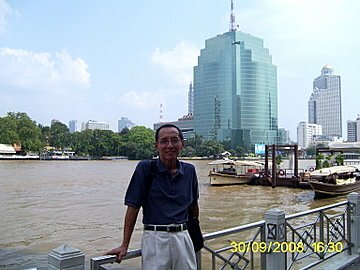 When I moved to Bangkok in 2003, a friend suggested I start a website as I love writing. But there was one major hurdle. I didn't know a thing about website building. Being a non-techie I searched the net to find out more. After searching for three months, I found a promising site called Sitesell, a one stop center for website building. Next I downloaded the Free Action Guide and studied it. Or take the video tour. There were no commitments; I could have just walked away if I wasn’t satisfied with what I read. Three months later and after reading the guide several times, I signed up for Site Build It, a comprehensive and easy to use website building program. As I brainstormed a concept for my website, another feature included in Site Build It, the events in the last three decades came flooding back. They provided the inspiration for the legendary figures, places and momentous events that left their mark in the landscape of Bangkok. The result is Tour Bangkok Legacies. With the help of Site Build It I learnt more in the process. I can now manage some basic HTML for my text links and graphics, something I was unable to when I first started. SBI also provides website building tips and techniques on a regular basis. If you're retired or near retirement and want something meaningful to do, consider building your own website. Pursue something you've always wanted to do in your life but was unable to. It's an enriching experience. When I first retired many years ago, I was adrift for a while. A good family friend, sensing my aimlessness, gave me a book, called “The Path – Defining your Mission and Vision”. What am I going to say to him? Back then, I was at a loss for an answer. I have no empires, no fortunes amassed, no best-selling books and invaluable works of art or architectural monuments to my name. Some years later at the urging of some friends, I decided to write a book about my travels in Bangkok. Eventually, I settled for self-publishing an e-book. It was another chance to talk about Bangkok legacies and tell my Bangkok story. Now if I meet that boy again, I can tell him, "I’ve written a book too. Would you like to read it? Here it is." If you have any comments, suggestions or feedback about Bangkok legacies, please e-mail me. It’s nice to hear from you.